sift the flour in a large bowl. add cumin, coriander, paprika and nutmeg and mix well with salt and pepper. 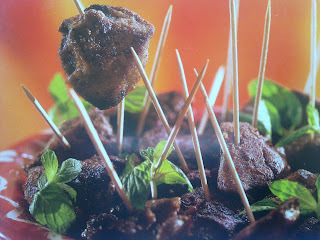 trim the chicken livers and dry eith kichen paper. cut the liver in halves or quaters and toss in the seasoned flour shaking off any excess. heat the oil and cook the liver in batches over high heat stirring frequently for 3-5 minutes, or until crisp on outside but tender inside. serve hot garnishing by mint leaves. 0 Responses to "spicy chicken livers"